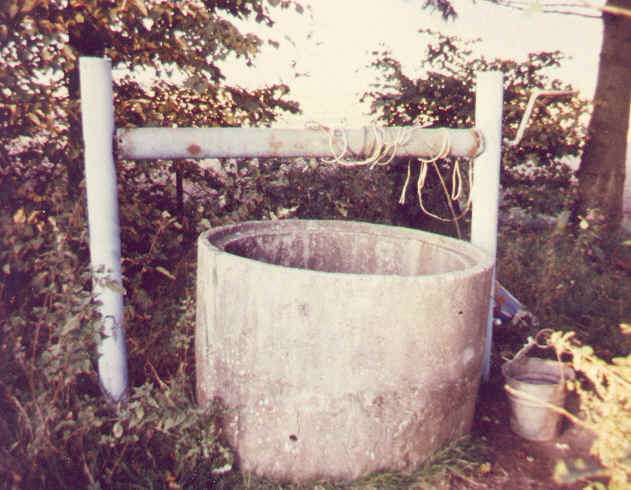 This century old well was still being used in 1992 Storks' nest, estimated to weigh several hundred pounds The beautiful Baltic Sea at the northern border of Kreis Greifenberg Pomerania was always known for its' fine geese. 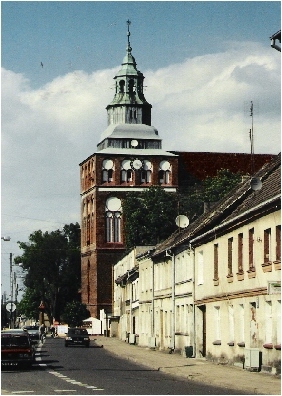 Carnitz - The Evangelical residents of Gützelvitz, Nitznow, Schruptow and Neides belonged to the parish of the Carnitz Evangelical Church. The village was owned by the Pommern noble family of the same name. In 1656 the occupants of the estate were Matthias, Matthias Friedrich von Carnitz, and the widow von Carnitz, nee Podewils. Some known residents of the village in 1656 were Hofmeister, Ohmb, Plack, Nordwich, Warner and Hafedank. A new church was being built adjacent to the original church and the old church was being demolished when I visited there in 1992. The Carnitz Evangelical Church records were microfilmed by the Mormons and are complete back to about 1765. 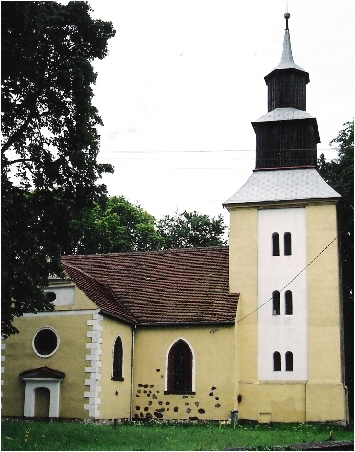 (The church on the left is the original Carnitz church. 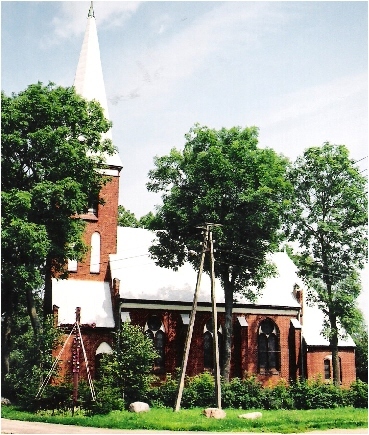 The church on the right was built about 1992; photo by Bill Ammons. 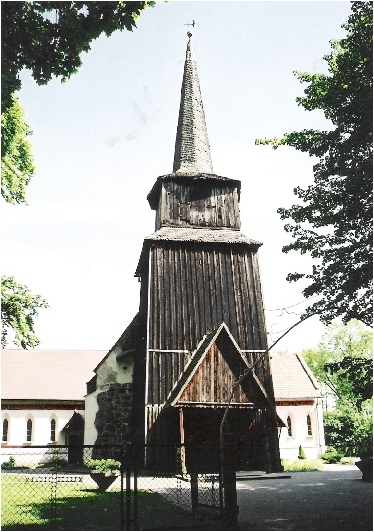 Eiersberg - There were 135 residents in Eiersberg in 1932, and their home church was at Kirchhagen-Wachholzhagen. In 1655, the estate owner was Amt Sülzhorst. Jürgen Schelhorn was Mayor. Glansee - There were 690 residents and 58 households in Glansee in 1870. They were all members of the Evangelical church in Gütslaffshagen. Glansee covered an area of 1006 Hectars. Greifenberg - There were about 7742 residents in the city of Greifenberg in 1932, of which 7549 were members of the Evangelical Church, 110 were of Catholic faith, and 82 Reformed Members. 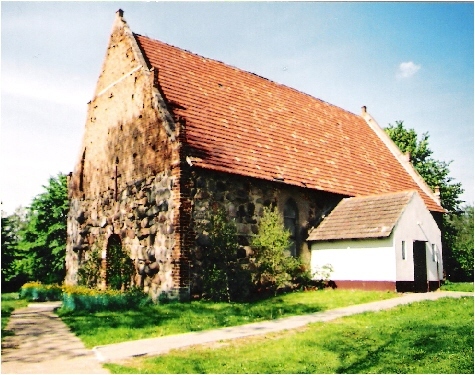 The residents of Lübsow and Schlellin were a part of the Greifenberg Church parish. The city covered an area of about 1 by 1.6 miles. The Rega River runs through Greifenberg and the city is often referred to as "Greifenberg bei Rega." The photo at the far left is a close-up of the photo to the right. The picture on the right is of the first baptismal font in Kreis Greifenberg. church photos by Bill Ammons. Görke - The owner of the estate in 1666 was Obrist Eggert von Brüsewitz. There were 264 residents in the village of Görke. The Evangelicals had their own church within the village. 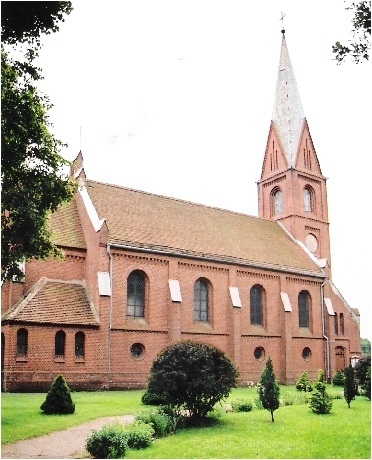 Borntin and Wödtke also belonged to the Görke parish. photo by Bill Ammons Gützelvitz - There were 196 residents in the village and he Evangelicals attended the Carnitz church. The estate owners in 1655 were Anna von Carnitz, nee Podewils, Matthias Friedrich von Carnitz and Matthias von Carnitz. In 1828 the owners included Kaufmann Wietzlow, of Stettin, together with the Carnitz family. Hagenow - The village had 57 households, which included 502 residents in 1870, and all were Evangelicals except for 1 Jew. The village covered about 50 acres. The Evangelical residents were a part of the Zarben parish during the mid' 1800s; The church pictured at the left was built later. photo by Bill Ammons. Hof - This picture at the right shows are the remains of the Evangelical Church in Hof. 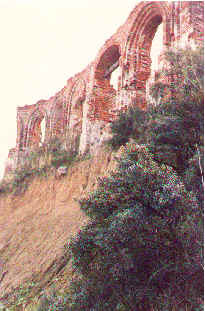 It has been gradually washing away from the tides of the Baltic Sea. There is a legend related on a placard near the church, "A priest caught a mermaid in the Sea and buried her next to the church. 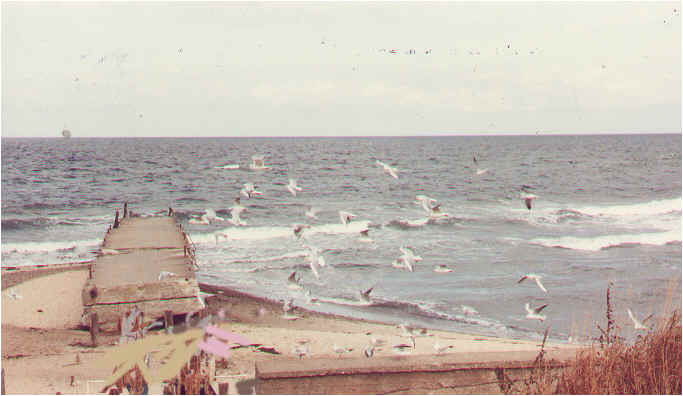 Now the Sea has been washing away the shoreline in a search for one of it's own." Kirchhagen - In 1932, there were 241 people living in Kirchhagen. Some records indicate the "Mother Church" for the area was Kirchhagen and some indicate it was in Wachholzhagen. 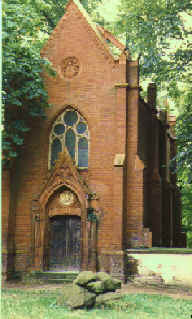 The church most likely was located where the land of Kirchhagen joined the land of Wachholzhagen. 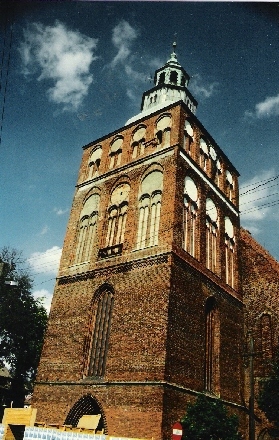 The owner of Kirchhagen was Amt Sülzhorst in 1655. photo by Bill Ammons. Klätkow -In 1871 there were 37 houses in Klätkow, which housed 47 families or 319 individuals. The village covered an area of 1153 hectars. Surnames found in village records include Ohm, Kaun, Pape, Lübke, Brehmer, Haasch, Leipe, Ebert, Kurth, Dumke, Zahn, Block, Hannemann, Scheredin, Töbe, Wefelow, Steffen, Grehlmann, Grahlman, and Bruß. Koldemanz - There were 296 people living in the village in 1932. 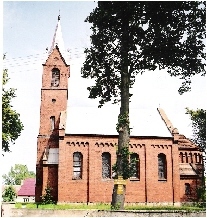 The Evangelical residents attended church in Batzwitz. In 1655, the estate owners were Hasso Adam and Ewald Joachim von Flemming. In 1666, the village was owned by Ewald Joachim, Caspar Joachim, Adrian Heinrich and Eustachius von Flemming. In 1870, there were 185 residents within the 8 houses on the estate and 70 residents living outside the estate proper in an additional 9 houses. In 1930 there were 296 residents, of which 266 were Evangelical Christians and 20 were Catholic.